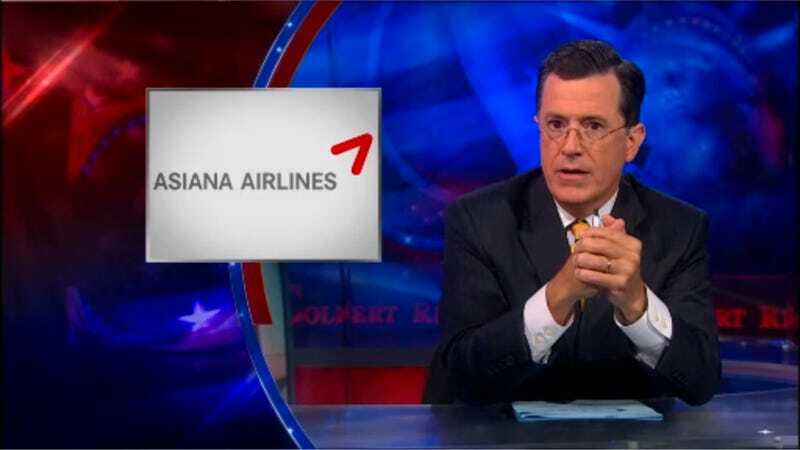 Stephen Colbert, America's last hero, is the latest pundit to come out swinging over the ridiculous pilot names announced on air by Oakland TV station KTVU after the Asiana Airlines Flight 214 disaster. He's not happy, people! In this clip from last night's show, Colbert points out the blatant racism of the names used in the broadcast. "I do not care who confirmed these names," he says. "It is wrong. I mean, 'Wi Tu Lo?' 'Bang Ding Ow?' This is a Korean airline. Those are Chinese names! That's racist!" If you're going to do a racist joke, at least get the names right.